I discovered Lee Child by accident about a year ago. This was at a time that I had started to get into the "thriller" type novel. 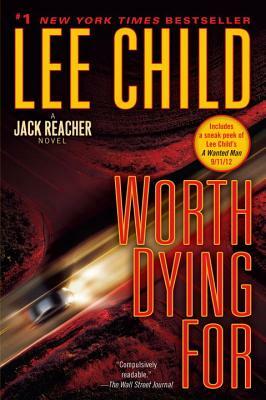 "Worth Dying For" is simply another good Reacher novel. Fans will enjoy it and others who haven't read Lee Child should give it a try. This is the 15th Jack Reacher novel produced by Lee Child and the character is as fresh and readable as he was in his first outing. The stories revolve around Jack Reacher, an ex-military policeman who travels around America righting wrongs using his accumulated knowledge of fighting bad guys. This time he is in Nebraska, helping out a small community that is ruled with a rod of iron, by a family who run a trucking business. Most of the locals are farmers and their lives and livelihoods are controlled by the Duncan family, a truly nasty bunch. Reacher comes across this difficult situation by chance, or so he believes. He travels without the encumbrance of luggage, romantic attachments or any real destination, moving from state to state without prior purpose, and takes each day and situation at it presents itself. As the story unfolds, Reacher uses his many and varied skills, mostly learned during his years in the army, to root out the bad guys and give the people back their lives, with the odd dead body along the way. There are some Italians, Arabs and Iranians thrown in to the mix, but most of the bad guys are locals. They have terrorized the population for decades but Reacher decides that it is time for them to stop their evil ways. I am a great fan of Lee Child's work and this book is no exception.